The cruise industry is showing its resilience as it recovers from an economic slump, a sinking and several ship incidents over the past couple of years, top cruise company executives said during the annual State of the Industry panel at Cruise Shipping Miami. Executives also emphasized the importance of attracting first-time cruisers as key to continuing the industry’s growth. 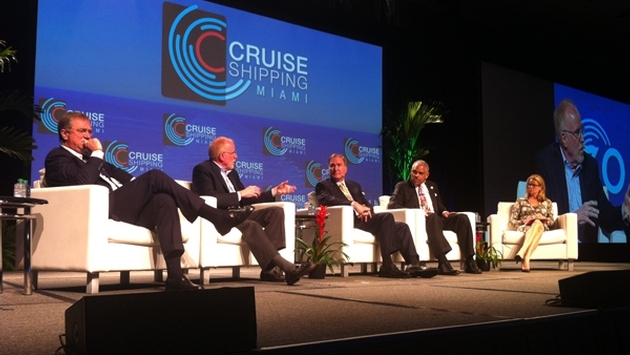 The executives made their comments during the opening session of Cruise Shipping Miami, taking place this week at the Miami Beach Convention Center. The annual conference, the industry’s largest and formerly called Seatrade, is celebrating its 30th anniversary this year and attracts more than 11,000 attendees. The executive conference included Arnold Donald, president and CEO of Carnival Corp.; Richard Fain, chairman and CEO of Royal Caribbean Cruises Ltd.; Kevin Sheehan, president and CEO of Norwegian Cruise Line; and Pierfrancesco Vago, executive chairman of MSC Cruises. Moderator was Katty Kay, anchor of “BBC World News America,” the event’s first moderator from outside the cruise industry and someone who has never taken a cruise. Over the past couple of years, several incidents have been covered negatively in the media, including the Carnival Triumph, which lost power after an engine room fire and had to be towed back to shore in February 2013, and a fire on the Grandeur of the Seas in July. Those incidents occurred the year after the Costa Concordia sank in Italian waters, killing 32 people. “We’re probably more cost-effective than visiting your relatives, and depending on your relatives, a lot more fun,” Donald quipped. He then referenced an earlier presentation by Christine Duffy, president and CEO of the Cruise Lines International Association, which shows that market penetration is only 3.45 percent in the U.S. “There’s plenty of upside opportunity,” Donald said. Fain said the industry needs to target first-time cruisers by overcoming negative perceptions, and “simple ignorance,” about the industry. “Although we spend a fortune on advertising and everything, the reason that people take their first cruise is because their friends tell them or their brother-in-law says, ‘you gotta come with us the next time.’ … And that snowballs,” Fain said. First-timers are attracted by new ship amenities and adventurous activities such as rock-climbing walls, ice rinks and such. Sheehan said his appearance on the TV reality show “Undercover Boss” continues to generate comments and reaction four years later. 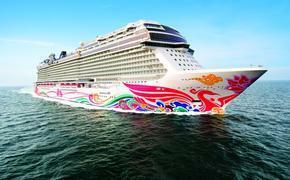 Norwegian also gained attention when its Norwegian Getaway was used as the Bud Light Hotel during the Super Bowl. The cruise line also gained new cruisers with its music cruises featuring famous bands. A key market is the 95 million millennials — those born between 1980 and 2000 — Duffy said in her remarks. Many of those young people first cruised with their families. “The multi-generational trend is a very good one for this industry,” she said.